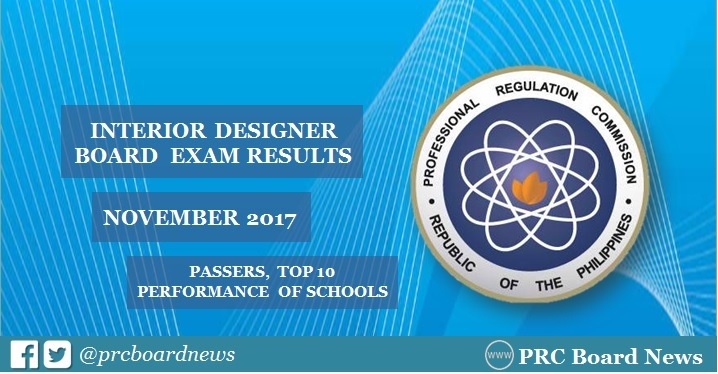 MANILA, Philippines – The Professional Regulation Commission (PRC) and the Board of Interior Design released results of November 2017 Interior Designer board exam on Friday, November 24, 2017 or in eight (8) working days after the last day of examinations. The official list of passers, top 10 (topnotchers), top performing schools and performance of schools are available on this page as announced online. PRC administered the Interior Designer licensure exam in Manila on November 7, 8 and 9, 2017. The three-day examination covered the following subjects: interior design, furniture design and construction, materials of design and decoration, history of arts and interior design, interior construction and utilities, color theory and professional practice and ethics. According to PRC Resolution No. 2016-1019, the target release of results for the recent Interior Designer board exam is on Friday, November 17. However, due to the suspension of government work in Metro Manila on November 13 to 15 in line with the Philippine hosting of ASEAN Summit, results are expected to be released on Monday to Wednesday, November 20-22 or in 4 to 6 working days after the exams. In October 2016 exams, results were released online in eight (8) working days. 213 out of 419 passed the Interior Designer Licensure examinations. Irene Kathleen Dee Dee from the Philippine School of Interior Design aced the board with 88.65%. University of the Philippines (UP) - Diliman was named top performing school with 95.35% passing rate (41 out of 43). Great post you have included with theirs. A solitary bread master is preposterous, so on the off chance that you are let you know can contribute in the money related security of your family and more info here giving an updated want for standard comforts. Amazing post, All the movement and the present changes that our reality have been seen till today is all prohibitive in perspective on the learning and find out here the bearing of the comprehensive network who utilized that for human welfare. Excellent post, I am very happy to see multiple students result in a single site. So here https://www.psydissertation.com/best-forensic-psychology-dissertation-ideas/ info is really helpful for the students. Understudies in perspective on their kin and their instructor need to verify impeccability their life and notwithstanding such perused here they even lose their veritable in light of the manner.